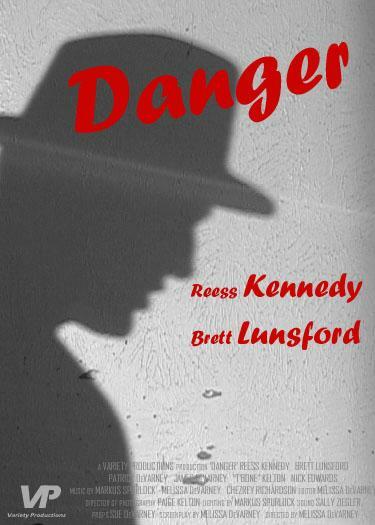 Danger is a film noir mystery where a group of gangsters plot to kill a newspaper reporter. The lead gangster, Sam, tails the oblivious reporter all night. What seemed like an easy job turns out to be trouble for Sam. Sam follows Charlie all night. Just before Sam shoots Charlie, Charlie wrestles the gun from him and reveals that he is a detective and arrests Sam. Film noir is a filmmaking style of the 1940's. Film noir stories were mostly mysteries with detectives. Film noir means "black film" in French because of the high contrast lighting typical of film noir. Cinematographers had fun making shadows out of anything (one of my favorites is using window blinds for cool shadow lines!). The first day of shooting was one of the last Sundays in March. It was an early morning and we had a slow start getting the set ready. But we got all of our indoor shots done, we had fun, and the acting was great! Our lighting expert thought of the idea of shining the light through the window blinds in the room from outside which looked awesome! We also had a light in the doorway so when a character walked in there was a cool profile shadow on the wall. The next day (Sunday) was our second (and last!) day of shooting. In the afternoon, once everyone showed up, we filmed our outdoor day scenes. That went pretty smoothly and quickly because we didn't have any lights to set up. It was also a really short scene so it only took about 2 hours to film. Our biggest problem was having all the modern cars parked all over the place! We were heading for a 1940's film. I have since decided that it's in the spirit of film noir and we did the best we could on our low budget! That night around 9:00 we started our outdoor night shots. I was really looking forward to this because this is where I could really have some fun with camera angles (our camera operator was gone so I took over and it was fun!). We started out filming the climax of the movie at my old elementary school (you can't tell it's a school by watching it though!). It was really windy that night and the area where we were filming was like a wind tunnel. We thought that would cause a lot of problems with the boom mic picking up sound but it didn't really mess it up. The wind actually added texture to the shot because the actors' clothes blew around (especially Sam's long coat!). It looked cool. Filming that part of the scene took about 2 hours. We had fun with the lights and casting shadows on the brick wall that was there. (Check out the still page for a picture of it). After we shot the climax we moved to a less exciting, but still interesting, part of the movie; the stalking scene with the gangster, Sam, and the reporter. Our main problem with shooting this was having all the cars drive by. I would have liked to close down the street but that was out of the question. We put up with it, did a lot of takes, and it came out very well. Our very last shots filmed were actually for part of the film that was mostly cut. We wrapped up shooting at 11:00 PM on Sunday, March 26, 2006. Everyone was extremely tired (I was actually seeing in black and white afterwards and looking at every shadow on the way home) but satisfied and proud of what we'd done. We were very thorough in pre-production which made things go as smoothly as possible on set. What happened in post production? Editing the film was a tiring process. We got an hour of footage which made editing a lot easier. We had a deadline for April 12th which forced us to edit quickly but make a quality movie. We also had to get the film edited so we could add in music and credits. Editing wasn't tiring because it was hard, just because editing a film means that you are extremely focused for a long period of time. I'm very pleased with the editing of the film and am a little sad to have cut some of the parts that I did but I think it was all worth it in the end. The music was a pain to get right. I wanted it to fit with the film noir genre and be a lot like the music in The Maltese Falcon. We were planning on sending Danger to film festivals so that meant we had to either get the rights to songs or make the music ourselves from scratch. It was too late to get rights so we started searching SoundtrackPro for the right sounds. We ended up going with a lot of string and orchestra music. The music was the last thing added to the film and I think we got it all in the day before our deadline. Thanks go to the entire cast and crew of Danger! Reess, Mr. Brett, Markus, Sally, Paige, ChezRey, Mom, Dad, Patrick, Mr. Kelton, Mr. McLaughlin, and anyone else I might have forgotten to add to this list! Thanks for the enthusiasm!